The aim of this semester project is to develop an algorithm able to detect objects and classify them, using the Microsoft Kinect. The final program detects standard ISO paper sheets (A4, A5) and inform the user of their format. The detection is absolutely independent of the orientation of the paper and the algorithm takes perspective problems into consideration. In addition, real time processing is required. 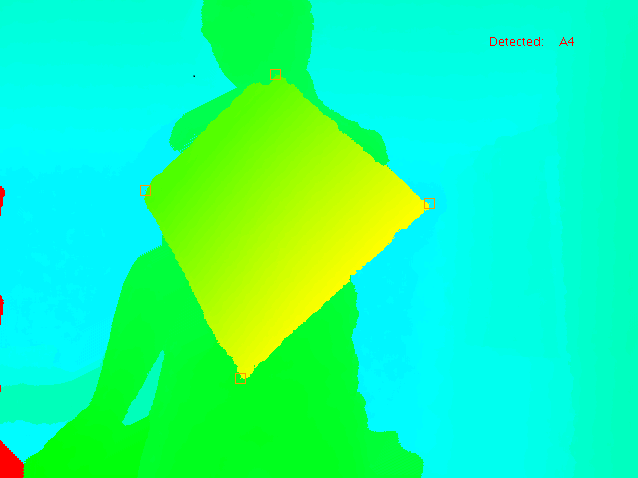 The code exclusively bases on the depth map computed by the depth camera of the Kinect (IR emitter and sensor). The program has been developed with the freenect libraries, which allow the communication and the control of the Kinect, while the ImageJ libraries where used to handle the input images and process them. In fact, it takes the form of a simple class, that can be easily reused. Since the program has been divided into many methods, it can be extended by integrating additional code, to detect other shapes. The detection itself is based on the object corners computation, used then to calculate the measures of the object. The developed program implements different algorithm, which include Sobel filter, used to extract object edges, and the Hough transform, to parameterise them.